Acting Director of the Bureau of Alcohol, Tobacco, Firearms and Explosives Thomas Brandon (from left), Acting Deputy FBI Director David Bowdich and U.S. Secret Service's National Threat Assessment Center head Lina Alathari are sworn in before testifying to the Senate Judiciary Committee on Wednesday. As students staged a national walkout Wednesday morning over gun violence, senior federal officials sat down for a grilling from Congress over law enforcement's failure to act on tips about the suspect in last month's school shooting in Parkland, Fla. The massacre at Marjory Stoneman Douglas High School touched off yet another round of soul-searching and national debate over guns in the U.S. that has drawn in activists, lawmakers and the White House. One major change this time, however, is that Florida teenagers who survived the violence are spearheading the conversation. The Senate Judiciary Committee officially joined the discussion Wednesday with a hearing that opened with Florida's senators begging their congressional colleagues to act. "We've had our fill of this in Florida the last two years," said Sen. Bill Nelson, D-Fla., before he listed the many mass shootings the state has endured, including the Pulse nightclub massacre in June 2016 that killed 49 people. Sen. Marco Rubio, R-Fla., raised his voice as he noted that the alleged Parkland shooter, Nikolas Cruz, "didn't slip through one crack, he slipped through every crack." 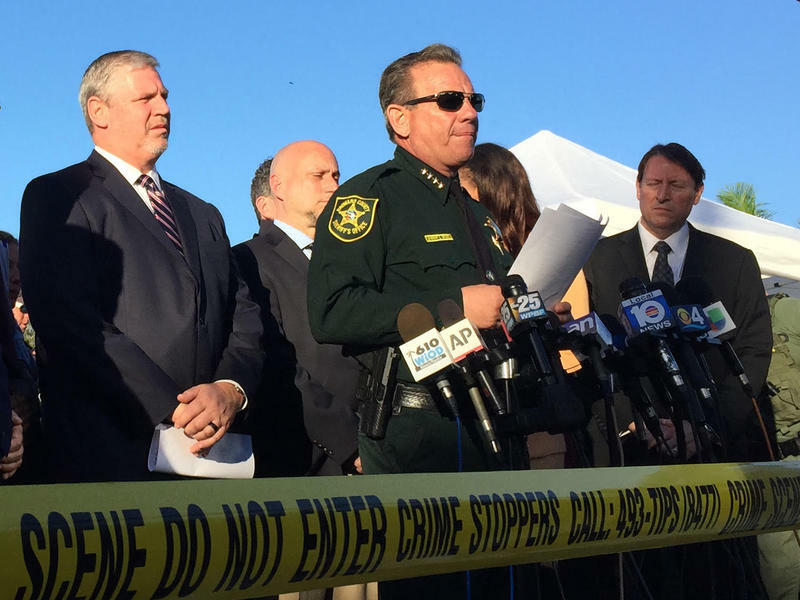 "This tragedy was the result of two things: the first is of a multi-systemic failure of government agencies at the federal, state and local levels," said Rubio. "And second because of vulnerabilities in our existing laws that need to be addressed." 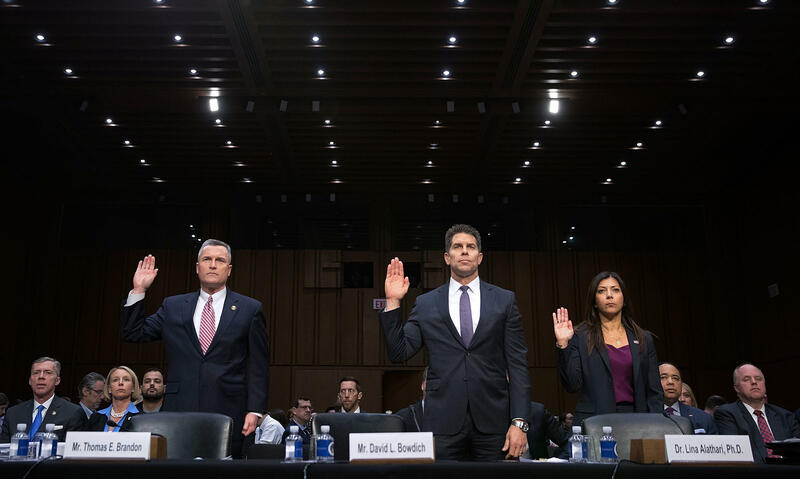 Questions about the FBI's actions fell to acting FBI Deputy Director David Bowdich, who testified alongside the acting director of the Bureau of Alcohol, Tobacco, Firearms and Explosives, Thomas Brandon, and the head of the National Threat Assessment Center, Lina Alathari. Bowdich walked senators through the timeline of when the FBI knew what about Cruz and the potential threat he posed. In September 2017, Bowdich said, the FBI received an email tip about someone posting on YouTube under the name Nikolas Cruz: "I'm going to be a professional school shooter." And then in January, the bureau's tip line received a call from a close friend of Cruz's family warning that he had made statements about harming himself and others. The caller said they were concerned about him "shooting up a school," Bowdich said. The FBI operator who took the phone call found the YouTube comment thread and consulted her supervisor. After that, however, the investigation was closed without any information being forwarded to any FBI field offices or any state or local law enforcement agencies. After questions from senators, Bowdich said the nature of the conversation between the operator and her supervisor remained unclear because the they gave differing accounts. "This is not the kind of news I want to deliver to this committee, to the families, or to the public, but we are committed to transparency in all that we do on behalf of the American people," Bowdich said. "When we make mistakes, we will not hide from them." Bowdich said the FBI is conducting a full-scale review of the tip line, which he said received some 765,000 calls, and 735,000 emails, last year. Local law enforcement also reportedly missed red flags. The Broward Sheriff's Office also received a tip about Cruz potentially being a "school shooter in the making," according to the Miami Herald. The newspaper says deputies didn't report the warning. Senate Judiciary Chairman Chuck Grassley, R-Iowa, said he was frustrated that representatives from the sheriff's office declined to testify on Wednesday. Ryan Petty, whose daughter Alaina died in the shooting, and a teacher at the high school, Katherine Posada, also gave statements and took questions as part of the hearing. Petty asked the lawmakers to put aside the basic divisiveness of broad gun control measures, to focus on specific common-sense reforms. Two weeks ago, Senate Republicans decided not to vote on gun legislation that would have changed the background check system for most gun purchases. "Americans are deeply interested in safe schools, in caring communities and in secure neighborhoods. As the family of one of the victims, we've learned at great personal cost that Americans can come together," Petty said. "We do not have to all agree on guns, and we won't. But we can agree on the most fundamental things." When asked by Grassley what Congress could do to honor his daughter's memory and legacy, Petty answered simply: Make sure "that this never happens again." As students staged walkouts across the country over gun violence, lawmakers on Capitol Hill sat down with federal law enforcement officials to talk about school safety. A Parkland parent and teacher also testified. NPR Justice reporter Ryan Lucas followed this and is here to tell us more. Hi, Ryan. SHAPIRO: Let's start with the FBI. They've received a lot of criticism over how they handled tips about the alleged gunman. Did we learn anything new today about how that happened? LUCAS: We got a few more details on the tips that the FBI received about the alleged shooter. Acting FBI Deputy Director David Bowditch said the FBI got two separate tips on Cruz. The first was in September about a comment posted on YouTube. Bowditch says the FBI checked it out. Agents couldn't figure out who posted it, so they dropped it. SHAPIRO: But that was not the only tip. You said there were at least two separate tips. LUCAS: That's right. The second one was when someone called into an FBI hotline in January. The tipster knew the shooter, knew that he had purchased weapons, knew that he wanted to kill people, expressed concerns that he might even shoot up a school. The FBI operator who took the call consulted with her supervisor. They discussed it, and the matter was closed. So the information was never forwarded to an FBI field office or to state or local law enforcement for them to follow up. So this does not look good for the FBI. Bowditch apologized for how the bureau handled the matter. He says they're reviewing how they deal with tips. And he says the FBI could have and probably should have done more. But he also says even if they did, there's no guarantee they could have prevented the massacre. SHAPIRO: As I mentioned, a Parkland parent and teacher also testified today. What was their message for lawmakers? LUCAS: Ryan Petty lost his daughter, Alaina. She was a freshman at the school. He expressed frustration with the FBI and local police that the alleged shooter was on the authorities' radar. And yet, he still managed to slip through the cracks. He also had some moving testimony in which he talked about the consequences of law enforcement and school officials not informing parents about the danger that the shooter posed. RYAN PETTY: By this action or inaction, we were rendered powerless to fulfill our most sacred trust as parents - to protect our children. LUCAS: Petty called on members of Congress not to focus on the differences that they have over guns and the whole Second Amendment debate. Instead, he said that they should follow the lead of what's happened in Florida, where lawmakers just passed a number of gun control and school safety measures. He says if they do that, Congress can get on the books now what Republicans and Democrats actually agree on. But he also says that he thinks it's important to identify troubled youth early and to get them the help that they need. SHAPIRO: And what did the teacher, Katherine Posada, say? LUCAS: She talked about the day of the shooting itself. Her English class was discussing, she said, Act 3 of "Macbeth" when the alarm went off. She described hiding with her students in the corner of the classroom, students getting phone calls and text messages from family worrying about their safety. And she says the students are going to wrestle with the psychological fallout of this for a long time. She mentioned how some students say loud noises or even the bell between classes makes them jump. 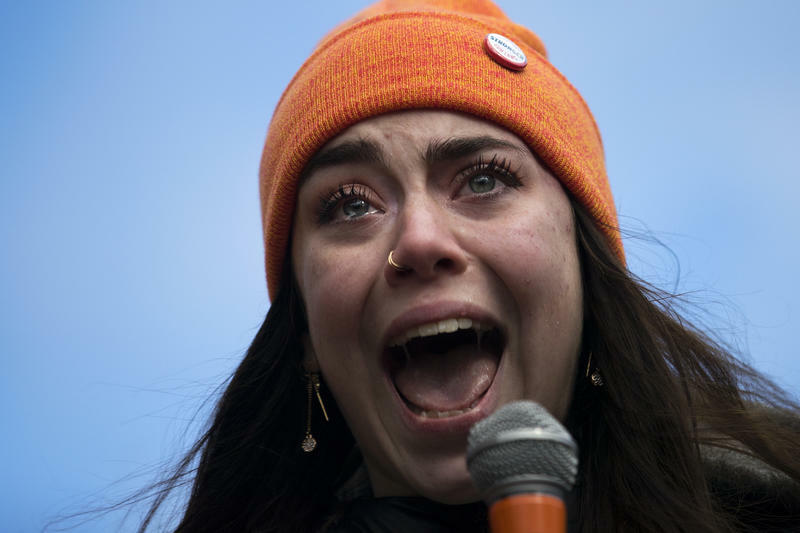 And she called on Congress, as well, to use the current momentum for gun control to get what she called common-sense gun laws passed. SHAPIRO: Any sense that that might happen? LUCAS: There appears to be a bit of bipartisan support for things like improving the background check system, so creating incentives for states and feds to provide the records that they're really already required to provide. But listening to members of the Judiciary Committee today, Republicans and Democrats largely retreated to the usual corners. So Democrats were arguing in favor of a ban on assault weapons and other gun control measures. Republicans, on the other hand, focused on the missteps of law enforcement that allowed the Parkland shooting to happen. So in other words, it wasn't about the guns. SHAPIRO: NPR Justice reporter Ryan Lucas, thank you. The FBI ignored a tip last month that the accused Majory Stoneman Douglas High School killer was dangerous and at risk of committing a school shooting. Seventeen people died in the attack. Exactly one month after the Marjory Stoneman Douglas High School shooting, students across South Florida and the rest of the country walked out of their classrooms to protest gun violence.